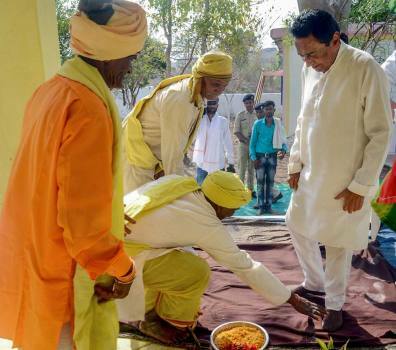 Madhya Pradesh Chief Minister Kamal Nath being greeted by supporters during Bada Dev puja ahead of Lok Sabha elections, in Jabalpur. 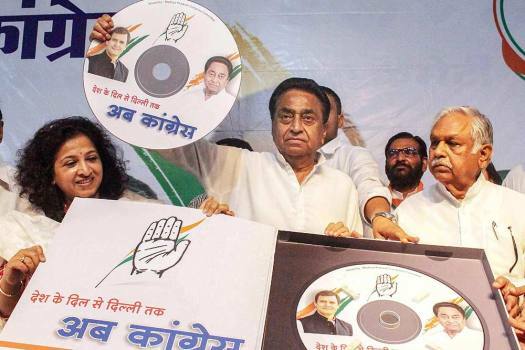 Madhya Pradesh Chief Minister Kamal Nath releases DVD of Congress party's theme songs for upcoming Lok Sabha elections, in Bhopal. 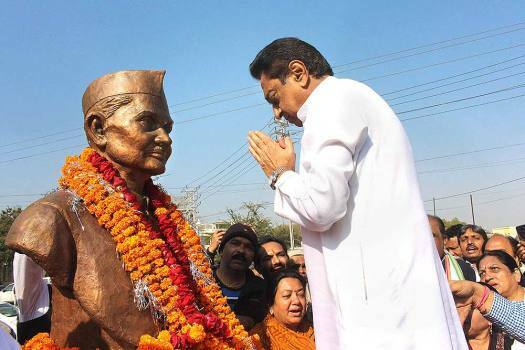 Madhya Pradesh Chief Minister Kamal Nath with former BSP leaders who recently joined Congress, at PCC headquarters in Bhopal. 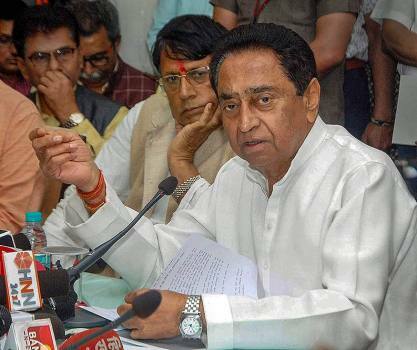 Madhya Pradesh Chief Minister Kamal Nath addresses a press conference at State Mantralaya in Bhopal. 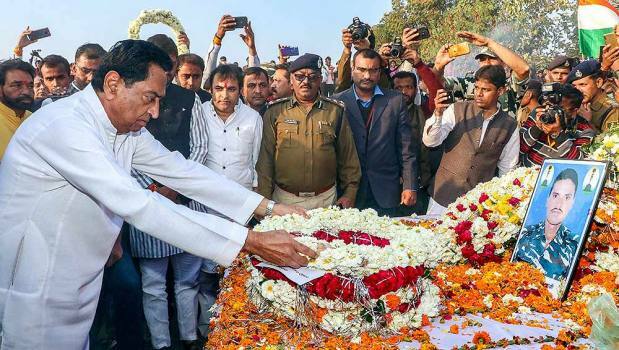 Madhya Pradesh Chief Minister Kamal Nath lays wearth on the coffin of CRPF jawan Ashwani Kochi, who lost his life in Thursday's Pulwama terror attack, in Khudval District. 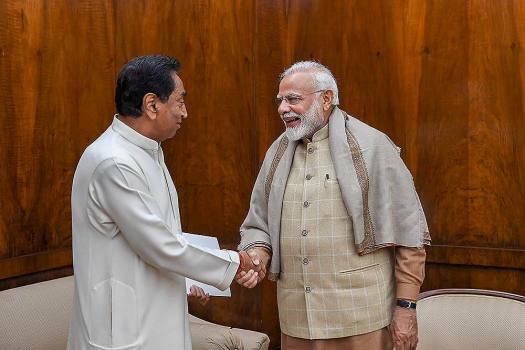 Prime Minister Narendra Modi shakes hands with Madhya Pradesh Chief Minister Kamal Nath, in New Delhi. Madhya Pradesh Chief Minister Kamal Nath speaks to a media person as Congress MP Shashi Tharoor looks checks his phone during the Budget Session of Parliament, in New Delhi. 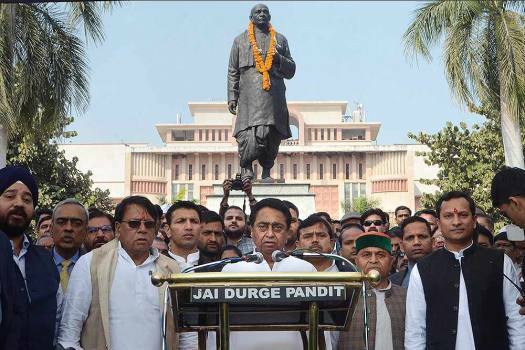 Madhya Pradesh Chief Minister Kamal Nath and other ministers recite 'Vande Mataram', the national song of India, in front of the State Mantralaya, in Bhopal. 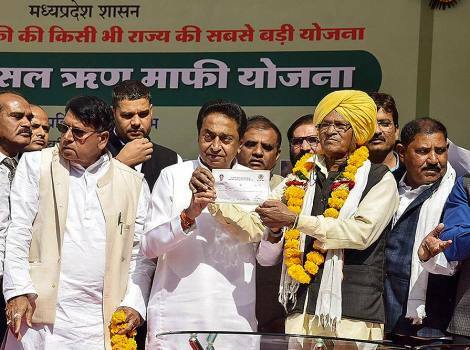 Madhya Pradesh Chief Minister Kamal Nath at the launch of farmers' loan waiver scheme, in Bhopal. 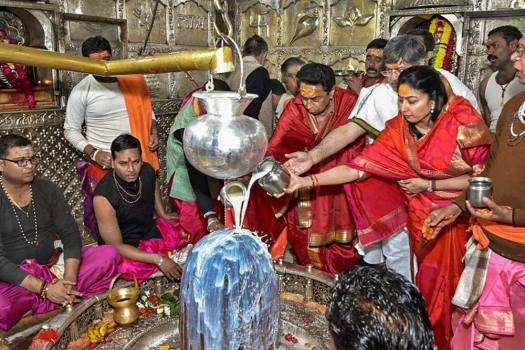 Madhya Pradesh Chief Minister Kamal Nath offers prayers at Mahakal Temple on the first day of the New Year 2019, in Ujjain. 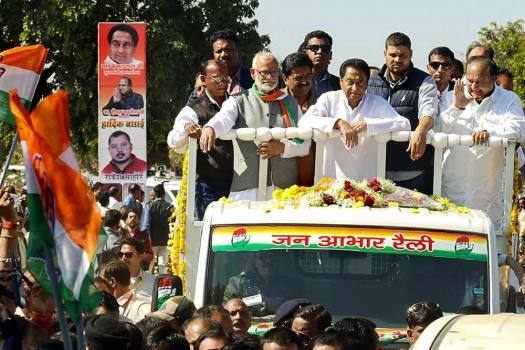 Madhya Pradesh Chief Minister Kamal Nath during his 'Jan Aabhar Rally', in Chhindwara. 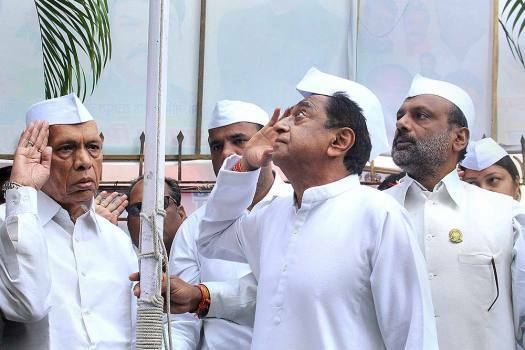 Madhya Pradesh Chief Minister Kamal Nath offers salute after unfurling party flag on the 134th Congress Foundation Day, at the PCC HQ, in Bhopal. 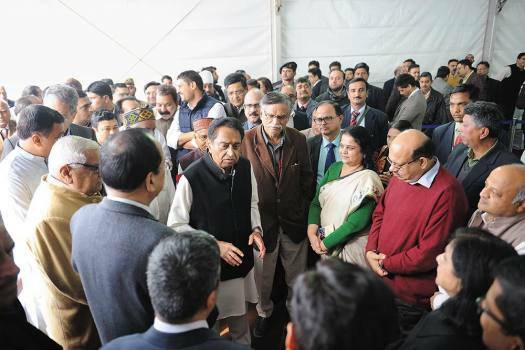 Kamal Nath, a Congress veteran said the ruling BJP will not be able to occupy the power seat after the Lok Sabha elections as it will not get the numbers and no other major political party will form an alliance with it either. 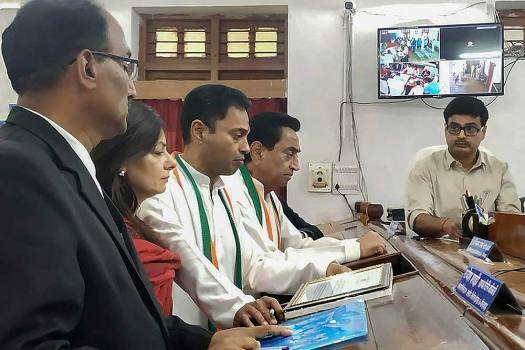 Madhya Pradesh Chief Minister Kamal Nath and his son Nakul Nath on Tuesday filed their nominations for the state Assembly bypoll and Lok Sabha election, respectively, from Chhindwara. Revenue Secretary A B Pandey and Central Board of Direct Taxes (CBDT) Chairman P C Mody have been called to explain the raids amid allegations by the Congress that the ruling BJP was using enforcement agencies to target it during the poll season. A team of nearly 200 officials from I-T department and state police swooped down on the premises at around 3am and recovered undisclosed cash amounting to Rs 10-14 crore. Income Tax officials conducted searches at about 50 locations in Delhi and Madhya Pradesh. A bench comprising Chief Justice Ranjan Gogoi and Justice Deepak Gupta sought the response of the poll panel and directed it to apprise whether the number of Voter Verifiable Paper Audit Trail (VVPAT) samples can be increased for the satisfaction of the electorate. Nath made the announcement about the quota benefits in government jobs and education at a function in Sagar and comes just ahead of the Lok Sabha polls. Nath Monday stated his government was implementing the poll promise, which was a part of the Congress' manifesto for the 2018 assembly elections, by asking industries to provide 70% jobs to local youths. Misuse of central agencies? 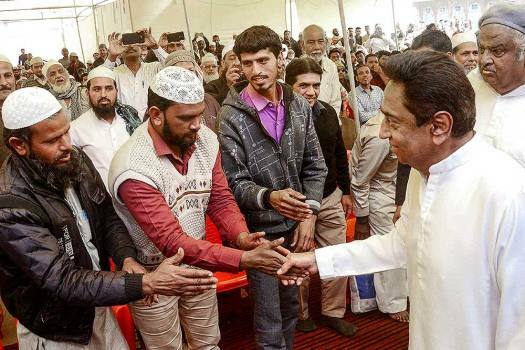 Barbs fly as taxmen raid Kamal Nath’s associates. 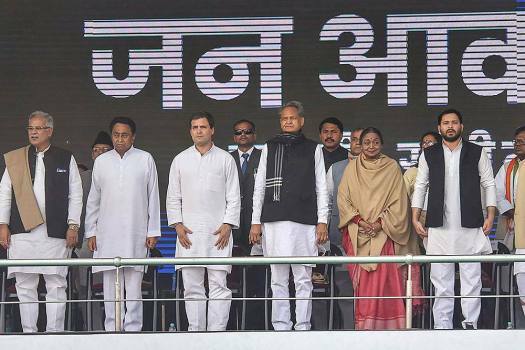 Congress has 114 MLAs in the 230-­member assembly, and has the support of four Independents, an MLA from the Samajwadi Party and two from the BSP. Sajjan Kumar should have been hanged. Still, his conviction signals some justice. The assembly poll results are a red flag for the BJP, but not really an endorsement of the Congress. 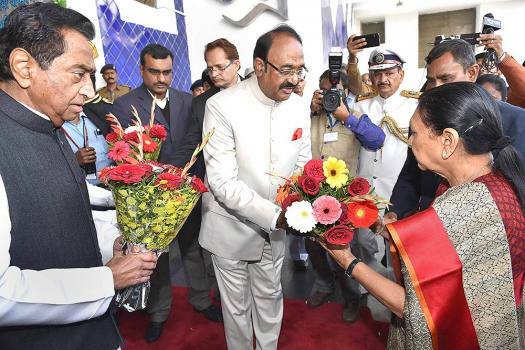 And the TRS victory in ­Telangana shows regional parties still have a key role to play in 2019. 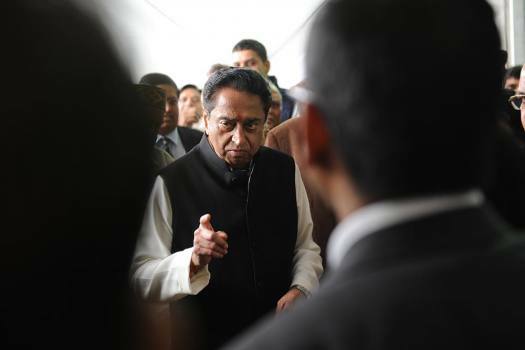 Madhya Pradesh Congress chief Kamal Nath tells Outlook that the party is on its way to a historic victory in the state. 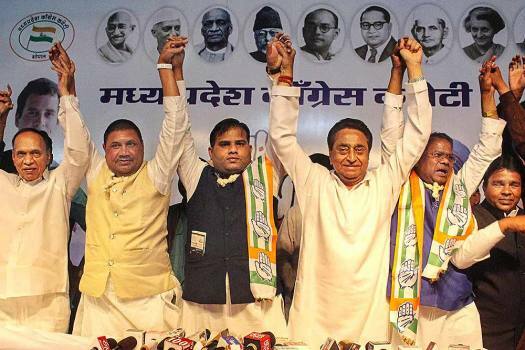 Small and regional political outfits may muddy the waters for the BJP and the Congress in Madhya Pradesh. 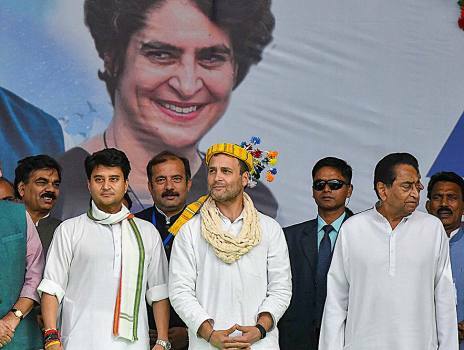 ‘Winnability’ is not a trait attached to the Congress too often these days. On this winter’s assembly poll results hinge the chances of a new spring. 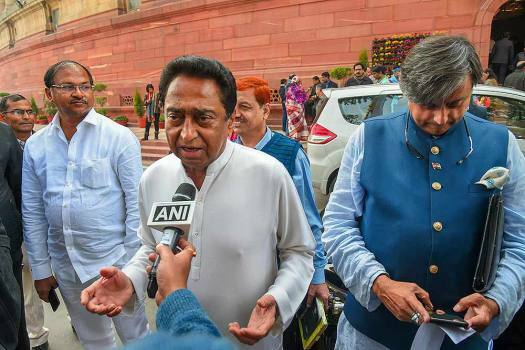 Longest-serving member in the Lok Sabha, Kamal Nath, takes over as Congress Madhya Pradesh party chief six months before elections. Is he up to it?